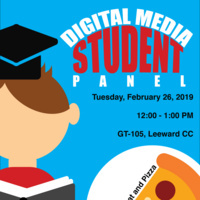 Digital Media students will share their experiences as freelancers in the industry. If you are interested in learning more about freelancing experiences from other students, this event is for you! Please register for this event on the link here. This event is hosted by Job Prep Services and Digital Media Program. For more information call Job Prep Services at 455-0231.